Angels With Dirty Faces (1938) is a classic example of a Warner Bros. gangster/crime melodrama of the 1930s - a slick, action-packed, hard-hitting studio film layered with a touch of social conscience. 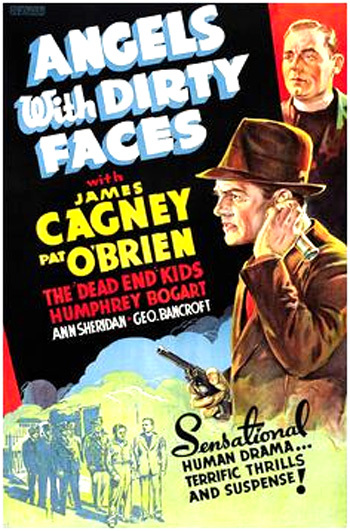 Director Michael Curtiz blended the irresistible story with a great, tough cast of marvelous characters, especially James Cagney and Pat O'Brien as its two stars, along with gritty locales and the street-wise "Dead End" Kids (from their appearance in the 1935 play and the film Dead End (1937)). The saga is the story of two childhood buddies from New York City slums on the Lower East Side in the 1920s: "Rocky" Sullivan (Frankie Burke as youth, James Cagney as adult), and Jerry Connolly (William Tracy as youth, Pat O'Brien as adult). The story of two kids on the opposite side of the law was a popular theme in other 30s films, such as Manhattan Melodrama (1934) and Dead End (1937). However, Rocky pretends to be a coward as he walks to the electric chair at the end of the film, to disillusion the "Dead End" Kids of gangster glamour. Cagney received his first Best Actor nomination for his performance in this film, one of the film's three unrewarded nominations (Best Director - Michael Curtiz, and Best Original Story - Rowland Brown), and he lost to Spencer Tracy's performance in Boys Town. As the film's prologue opens, young Rocky and Jerry are on a fire escape, teasing neighborhood girls below, including one in pigtails named Laury Martin (Marilyn Knowlden as youth, Ann Sheridan as adult). They go into a railroad yard and break into a freight railroad car to steal some fountain pens. They are spotted by a railroad inspector who blows his whistle to notify the police. Rocky and Jerry make a break for it. Jerry escapes police pursuit because he runs faster and climbs a fence, but Rocky is caught. Rocky is sent to the Society for Juvenile Delinquents and refuses to identify his friend. Then he is sent to reform school for petty larceny. In a montage of images, Rocky graduates to prison as he pursues a life of crime including bootlegging, manslaughter, gambling, and violent gang rivalry. Mobster Rocky is sent to prison to serve another three years for a crime he has committed with crooked attorney James Frazier (Humphrey Bogart). He is promised by Frazier that when he is discharged after taking the rap, he will be paid $100,000 from the crooked heist the two had pulled. Rocky asks Jerry how he decided to become a priest. Jerry tells him he received his call when riding on the top of a bus past a cathedral. Rocky comments on a similar experience: "That's funny. I got an idea on top of a bus one time. Got me six years." Jerry faces the challenges of teaching boys like Rocky when he was younger and working with tough, gutter-bred neighborhood boys (including the "Dead End" kids), trying to make them decent citizens. With a recreation center, Jerry explains that he "keeps the kids from becoming...," but before he can finish the sentence, Rocky pipes up and finishes it for him: "...hoodlums like me." Rocky explains that he plans to rent a room close to the church, and Jerry is glad to have him back in the area. Rocky tells Jerry that he will attend Mass on Sunday: "Yeah, sure. I'll help you with the collection." Coincidentally, Rocky meets and renews his acquaintance with a pretty neighborhood girl, Laury Martin/Ferguson, who is the manager of the apartment where he inquires about room rentals. He pays the $5/week in advance and then she recognizes him when he explains he was referred there by Father Jerry. To pay him back for all the years he teased her, she slaps him, jerks his hat down over his head, and runs out quickly, telling him: "I've waited fifteen years to do that!" I'm not taking up with anybody but you. You figure it out for yourself. I'm taking up with you where I left off. That was the agreement and we're gonna stick to it. Got it? Keefer is introduced to Rocky, and promises he may be included in their rackets or maybe given an interest in their lucrative nightclub: "Maybe I might have a spot for you." Rocky plans to meet Frazier the next week, to be paid the balance, but after Rocky leaves, Frazier pulls a double-cross and has Rocky identified for a hit. As Rocky walks through his neighborhood, he is identified as a "sucker" and pickpocketed, his wallet stolen by the tough "Dead End" gang that Jerry works with. Rocky follows them to their dark basement hideout, walks in on them, and threatens them with a fake gun in his coat pocket: "You're all covered...Say your prayers, mugs." He collects his stolen money, and tells them they shouldn't rob anyone who knows their hideout. He walks over to the wall and shows them his initials "R S," carved there many years before. Because of his criminal exploits, the boys idolize him and regard him with almost fanatical hero worship when he shares his criminal exploits and experiences: "Never bother anybody in your own neighborhood. You kids got a lot to learn."